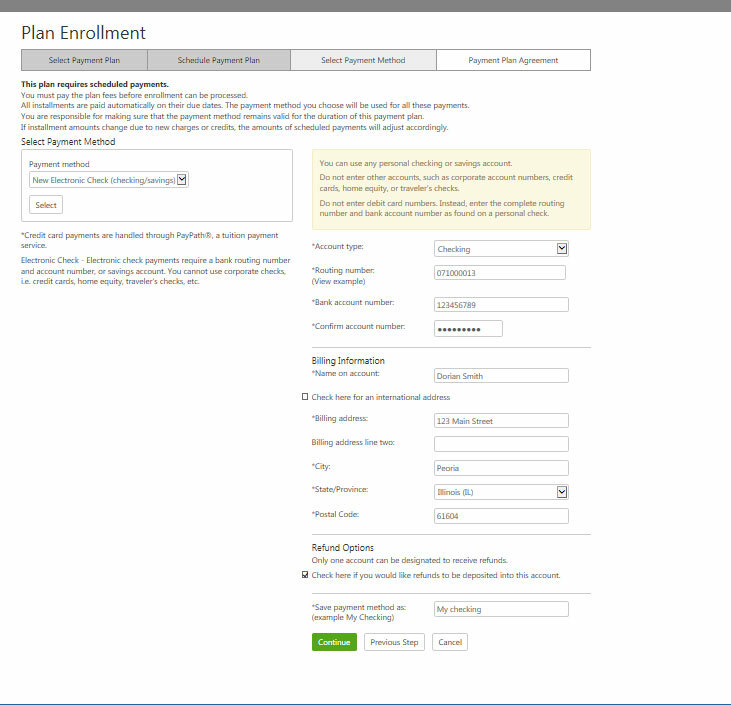 Click Payment Plans from the menu at the top of the page. 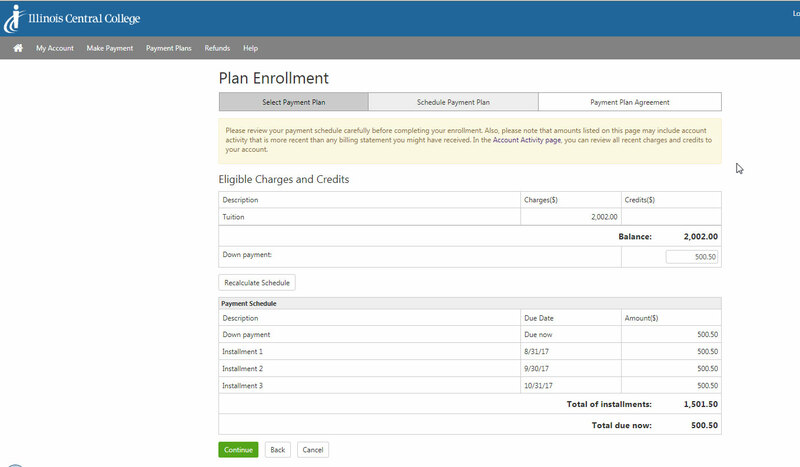 Select Enroll in Payment Plan. 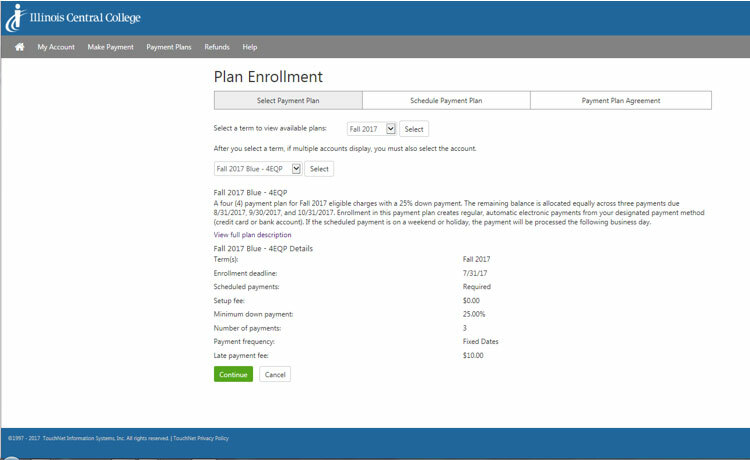 Based upon the semester and date you enrolled, you will be given a range of payment plan options. Be sure to note the number of payments and the required down payment to set up the plan. Select the term and then select the plan that best fits your needs. Review the detail of the plan you selected and then click Continue. Click Display Schedule to see the installment due dates. Review the schedule and click Continue. Select a payment method. 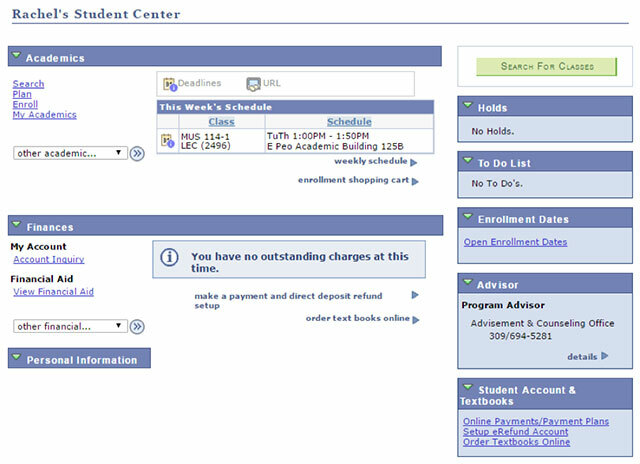 IF you have saved an electronic check payment method previously, it will be listed in the dropdown menu. After choosing a payment method, click Select. Follow the on-screen instructions. Electronic Check example is shown. Credit Card via PayPath option will take you to PayPath Payment Service and the amount paid will be subject to 2.75% convenience fee. More instructions on completing PayPath transaction can be found under Making an Online Payment. Enter your bank information including routing and account numbers. Double-check your data to ensure your information is accurate. Be sure to include all digits of your account number. If you are in doubt, please contact the ACH department at your banking institution. When entering a New Electronic Check method, you have the option to designate your account as a Refund account. If you wish to do so, check the box in the Refund Options Section. You must save the payment method in order to continue. Please use an identifying name you will recognize in case you have multiple payment methods. When finished, click Continue. 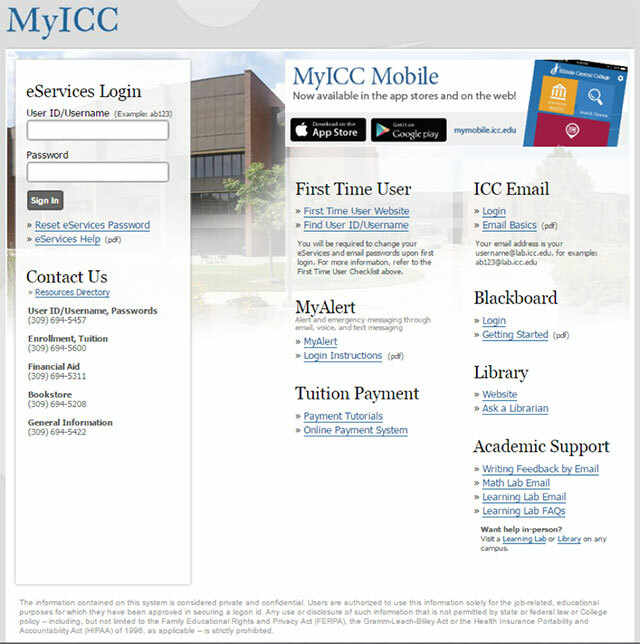 ***Please be sure to use an account you, as the student, will have access to at all times. 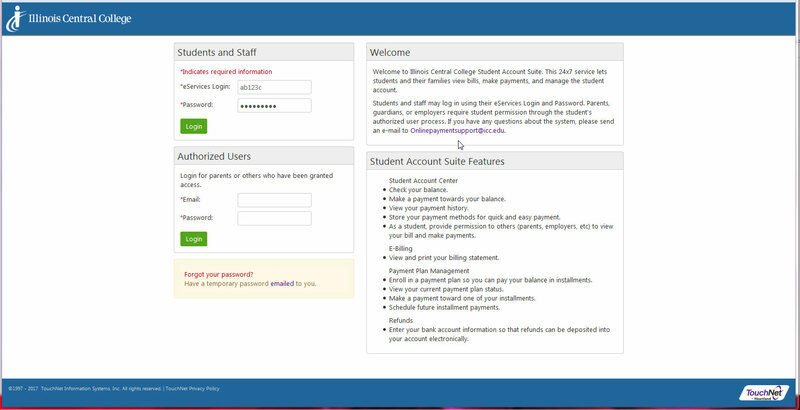 The verification process does not confirm the account belongs to the student, it confirms it is a valid account. Please do not use a friend’s account. If the friendship sours and the student does not remove the Refund account from the system, funds issued to that account will be lost to the student. 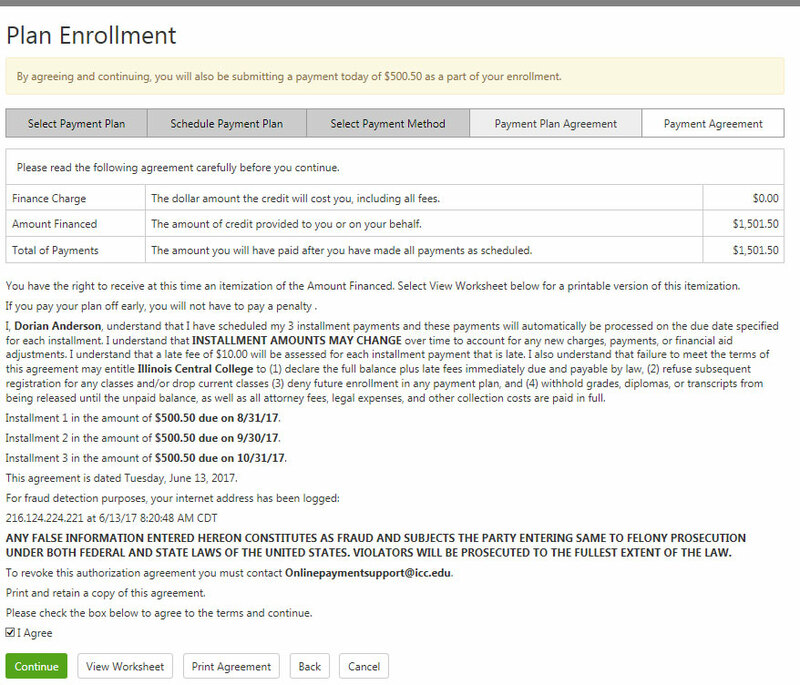 You must agree to the term and conditions of the payment plan. Please review carefully and note the upcoming installment dates. 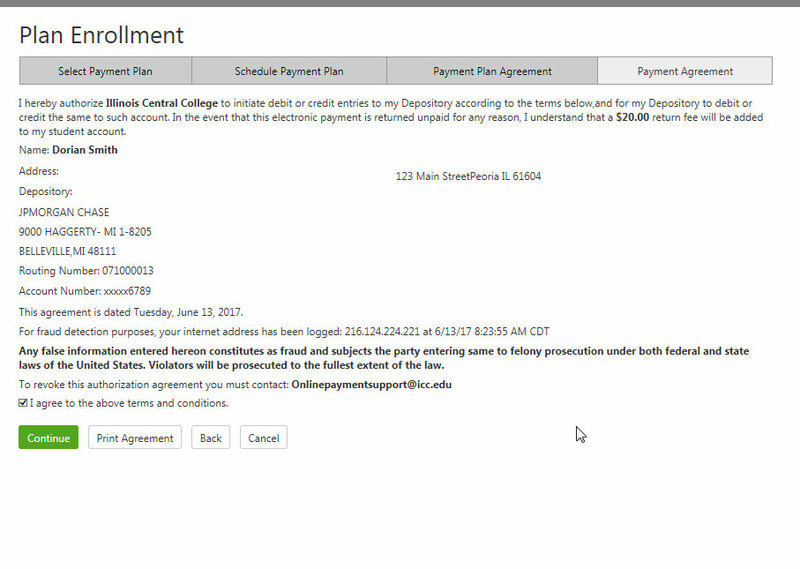 You are scheduling the payments by agreeing to the payment plan. After reviewing the plan, check the box next to I Agree and click Continue. If you elected to designate your Electronic Check as a Refund account, you will need to agree to the terms and conditions for that account. Check the box next to I agree to the terms and conditions statement and then click Continue. 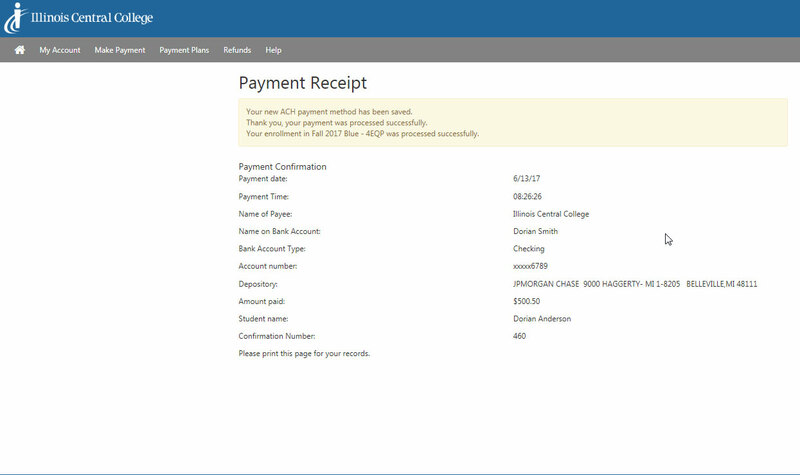 Congratulations – you have successfully enrolled in a payment plan at Illinois Central College.